(Joe) The next day brought Giza and the land of the Pyramids and Sphinx. (See video for explanation of the riddle of the Sphinx.) It wasn't too hot. Our taxi driver, amidst our protest, stopped to try and give one of his buddies some business. It seems that his friend was a horse dealer. The Arabic sign read, "Horses for sale, lease, or rent. Starting price: 2000 Egyptian pounds. Offer me 500 and we'll settle for 1000." We declined, paid our fees to walk around the pyramids, and got an official Government guide. Without this "official" guide, Matt, Dave, Greg, and Chris would not have been able to climb one of the 9 pyramids. There are 3 big ones, 6 smaller ones, and 1 Sphinx. I believe the tallest one was 147 meters (450 feet). Pretty neat. Also seems a law that the best quality things are made by slave labor. After the Pyramids, our guide took us to the perfume shop where he gave everyone free cokes (except me who got hot tea with hand crushed mint leaves and a lime thanks to my friends who told him that I was sick.) Greg, Matt, and Dave were seduced by the charm of the perfume lady and bought 25 grams of perfume for 35 pounds ($12). That was not the first time that day that Greg saved my life. I really needed to sleep off my cold so he found us a cheap air-conditioned hotel and I hit the sack at 5pm. Yes, it was hard with all the honking and yodling, but I feel much better. Someone else will have to relate the night life. After that, I'd like to briefly tell you about, "The Boy in the Bubble." (Sam) Our "tour guide" for the pyramids was named Kamil or David to you Christians. Kamil started out pretty well but quickly degenerated into a pile of camel dung. The metamorphasis was incredible to behold. We walked to the smallest pyramid, Kamig always in front. He had amazing sand speed. In fact, as I think back, he sort of looked like a sand person from Star Wars. He told us many interesting fun facts about the pyramids, but he talked so fast in his broken English, I could not understand a word he said. I just stared at his hideous teeth thinking, "Wow, I could make a fortune off this guy. I wonder what kind of insurance plan he has." The only time Kuang spoke intelligibly was when he was trying to sell us something. e.g. an Egyptian robe or a camel ride. 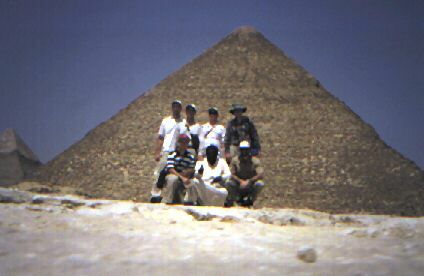 The boys climbed the small pyramid for $10, as stated, while Joe and myself sat with Dung. Dung then led us quickly though the sand and a garbage heap to his perfume store. We thought he was taking us to the Sphinx. As stated above, some of the 'weeds caved to the hard sell. Only the free cokes made it all worth while. 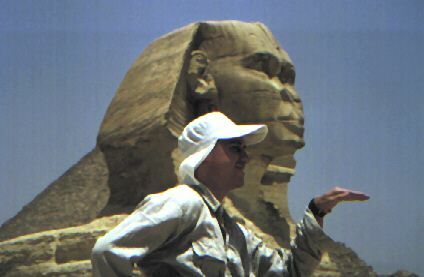 Dung then took us outside, pointed to the Sphinx and told us he was finished with us. I offered him 30 Egyptian pounds ($9) for the "tour" but he said it was not enough. We t-weeds then had a quick debate (we were getting good at this) and gave him 60 Egyptian pounds. Greg with his generosity, however disordered it is, gave 10 pounds from his personal allowance. Chris wants me to tell about the Cairo museum also but all I can remember is that we slept there. We went back to the Sultan of excrement and Kiwis to eat our lunch that we had bought on the way. Here, we invented the round robin method for drinking the single flask of soda. Then, we checked into the Carlton of paradise and made ready to walk to the fabled bizars of Cairo. Here is the magnanimous yet obsequeos Charles Brown whom I love dearly to tell the tale. (Dave) O boy, where should I start - a lot has happened since my last log entry. Right now, we're on a train heading south to the heart of Egypt - Luxor. From Cairo to Luxor, it takes about 10 hours. We've been on the train 7 so far. Today, I would like to talk about our interesting stay in Cairo. In Greece, the key word which described that country was "rocky." Rocks were to be found everywhere you turned. In Cairo, however, I believe the key word to describe that city would be something like "chaos" or perhaps "germ-infested hell-hole." You see, Cairo is really a lot like New York City - with only a few minor altercations. First you take New York, triple its population and then add about 2,000 years of dust and dirt. Add a few million bugs and flies for flavor. Next, take out all the red lights and any semblance of obedience to traffic laws. Then, get everyone off the sidewalks and into the streets. Blend this all together with a couple hundred thousand crazy cab drivers and you have Cairo. I might add - I haven't touched anything since we landed in Cairo. As a result, the guys have affectionately nicknamed me "the Boy in the Bubble." I must say, however, even with its obvious shortcomings, Cairo will be a city I'll never forget. 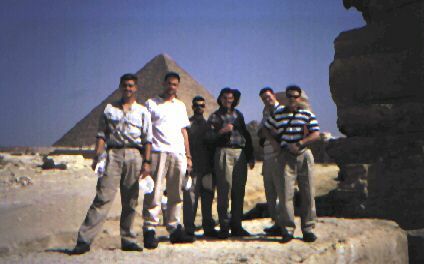 While at Cairo, we also visited Giza. Another I have memory of Cairo is its ever-present, ever-insistent bargaining. I've never bargained so much in my life. But from the time we passed through the gates at the airport to the time we boarded this train, we just bargain and bargain and did some more bargaining. But that's not half as funny as the fact that you're bargaining for something you didn't even want in the first place, like our ride from the airport to our hotel. Our driver wanted to take us to about 3 other hotels - practically any hotel but the one we wanted to go to. Not to mention him trying to plan out our trip for us and offer to us a whole travel package. He's not alone though - all Egyptians seem like this - from the ten-year-old boy selling newspapers to the octogerian who is trying to sell you lamp shades. I think they must all go to school for this (called "bargaining school"). Well, that's it for now - a few humble reflections from the "Bubble." Visiting Cairo was definitely a unique experience. (Greg) It seems that the task of closing the T-weed discussion of Cairo has fallen to me, "the Body." Without a doubt the city made a huge impression on us all. More pages have been written in this log about that single day in Cairo than our whole time in Greece. Up to this point, Cairo has been portrayed as a dirty, chaotic town where one is never free of hagglers. To the western eye, this is the way it appears, but this is a world different than our own. Drivers honk incessantly, but its purpose is to let other drivers know that they are there. No one uses the marked lanes, so blinkers are of no use. The bargaining and haggling is just another form of competition. Tipping is part of their basic philosophy. Those who have give to those who have not and a service rendered deserves a reward. I personally loved Cairo and could have spent more time there. The people were friendly, fun-loving, and very helpful. According to our indispensable "Let's Go" violent crime is almost non-existent in Cairo. Spending these last 8 hours with these Egyptians on the train to Luxor has proven to me what a fun-loving people and happy people this is. Well, enough about Cairo. On to Luxor! (Chris) NO BODY - More about Cairo! That night we went for a walk. Leaving Joe in the room of the posh (sort 0f) Carlton, the other 5 of us went in search of the bazaar. Body thought it would be a 20 minute walk. After asking a few directions, we found it in slightly more than that. We hit the most fascinating part of the daily bazaar first - MEAT! Imagine about 70 butcher shops, all in an alley about the width of a car - on both sides. Now imagine that each shop has no walls and that the actual butchering takes place just as close to the narrow path in the alley as the selling does. Men of all ages (and some women) were hacking and chopping up pigs and cows. Blood ran down the alley. 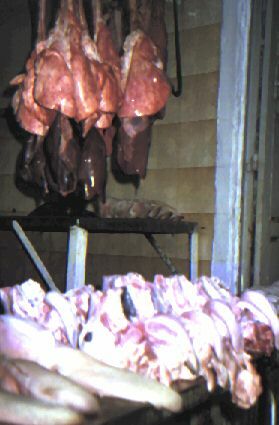 Hooves, brains, intestines, tails, and fully-skinned meaty cow heads were arranged and displayed with care. People not at work were walking hurriedly up and down the alley. From our vantage, it was crazy and completely a cool culture shock. Bubble boy turned on the defense mechanisms and tried to hold his breath the whole way down the alley. Matt looked about in wondered joy. There was alot of yelling and haggling going on - it was pretty dark except for the harsh one light bulb in each open air shop. It smelled, but I've smelled worse in Cairo. It was a meaty wonderland. The rest of the bazaar was similar in the crowding and noise and narrow, dark streets, but never was as gruesome. Everywhere we went, we were stared at. I think very few had ever seen tourists at this strictly local bazaar phenomenon. 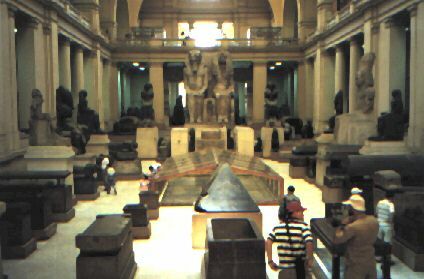 They were so taken back by us that there was far less selling attempts than at tourist sites in Egypt. Most who made eye contact said happily, " Welcome to Cairo!" and asked where we were from. We saw, after the meat district, the radio district, the machine shop district, the furniture district (extremely nice, hand-made furniture but also the least crowded area) and eventually, the clothing district. The clothing was colorful and was on a wider street. Nevertheless, all of the tiny stores lined up their wares on racks outside so that the whole street was full. There was no signs of cars anywhere at the bazaar, even though the surrounding streets were crammed with the Cairoean horn-honkers. Suddenly, groups of the salesmen went running by us, carrying their racks of clothes from the street. One of them thought it was funny - most others seemed a bit nervous as they ran. That one saw our intrigued expressions as he passed and said, "Cops, cops!" So we looked down the main clothing street and it was in chaos. All of the merchants were busy taking all of their racks of clothing from the street back inside. People were running everywhere. Within a matter of minutes, the street was empty except for the trash (ever-present here). Now, with the sea of clothing racks parted, we could see the truck of 3 or 4 cops confiscating from the 2 businesses at the far end of the street. We asked a shopkeeper why. He indicated that it was illegal to sell on the street. The 2 storekeepers who were caught and had stuff seized looked very upset and sad. Our ever-moving single-file caravan of tall, white guys made our way back through the wild 10pm traffic to our hotel, stopping only for a few groceries. After a rosary beneath Body's tiny travel crucifix, we slept the sleep of the pharaohs under the air-conditioned bliss of a sealed Cairo hotel.